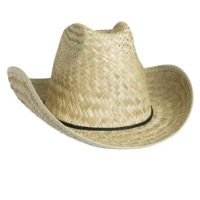 This Mexican seagrass cowboy hat is our most basic and inexpensive straw western. Note: This item does not have an interior sweatband. For a "step up" look at our items #2458, #2464, #2462, and #2463. Each of them features a U-Shape-It brim and elastic terrycloth hatband.